It may seem almost unbelievable to some, but in January 2019 I will have been to 49 of the 50 Shooting, Hunting and Outdoor Trade (SHOT) Shows sponsored by the National Shooting Sports Foundation (NSSF). Interestingly, I am probably not the only elderly member of the firearms community who can make that claim. But as we put together this 2019 edition of our SHOT Show product preview, I thought this milestone event warranted a bit of reminiscence because there have been some noteworthy moments. The only SHOT Show I missed was the first, held in St. Louis, MO, in 1979 when NSSF broke away from the annual National Sporting Goods Show, usually held in Chicago, where guns and outdoor sports were only part of the larger sports community. Winter weather proved a problem for that inaugural Midwest show which was nevertheless a big step forward in an industry that relies on early year product orders in order to schedule production before the big retail demand in the fall. Actually no industry can safely anticipate how much product to make before its big sales season. Even the huge annual housewares shows, which I had once also attended, relied on the early orders to keep factories working through the spring and summer. So my first SHOT Show was in San Francisco in 1980, which was held in the Cow Palace in a city in which Mayor Dianne Feinstein launched an early attack on lawful gunowners and their guns. The show in the Cow Palace had been scheduled before Feinstein launched her anti-handgun campaign in the hopes that California would provide a more traveler-friendly climate. My recollection was that the Cow Palace was not the best facility for a SHOT Show, since the Gun Week booth that year was among several small 10-foot booths relegated to hallways. Part of the problem was that the show had grown considerably from its first year. The political climate in San Francisco and all of California, for that matter, caused NSSF to pledge never to return to a venue there. So the next show was held in New Orleans where the weather and the political climate were more conducive. That show set up in the Super Dome, which also presented some logistical problems as some of the booths were laid out in the ramp aisles for the arena. The next show was in Atlanta, the first of at least three or four held in that city. As one gets older, memories fade. But the SHOT Show was becoming bigger and busier every year. I have two memories of Atlanta SHOT Shows. One involves the year that an ice storm struck the city on the opening day of what was scheduled as a three-day event. By the end of the show’s first afternoon, the ice on Atlanta streets was about four or five inches thick curb to curb. It was almost impossible to walk to the Marriott several blocks away. In those days, it was common for major gun manufacturers to host large receptions for their best customers and the gun press. The number and size of those events has diminished somewhat over the years. However, the year of the Atlanta ice storm, Colt Firearms, had scheduled a reception at the Omni Hotel which happened to be the hotel closest to the World Congress Center show. Graciously, Colt threw open the doors of their reception for almost anyone attending or exhibiting at SHOT. Still, eventually in little groups, we managed to get back to the hotels, sliding on the ice arm-in-arm. The ice storm cut the attendance of many exhibitors and attendees of that Atlanta show as people opted to leave if they could get transportation out of the city. The other memorable Atlanta SHOT Show remembrance involved the visit to the trade show by former President Jimmy Carter accompanied by a half-dozen Secret Service personnel. He lived in the Atlanta area and his presidential library is located there. As far as anyone could tell, Carter was curious about the relatively new SHOT Show and while he had a reputation as being anti-gun while in office he was a hunter and had a fondness for beautifully crafted shotguns. Carter wasn’t the only notable in attend a SHOT Show. Over the years there have been many notable politicians, famous actors and theater people, best-selling writers, musicians, and a significant number of other notables, Some were there in connection with specific exhibitors, and even spent some time at those booths, meeting attendees and signing autographs. The SHOT Show is a testament to the universality of the shooting, hunting and outdoor sports. As the show has grown over its first 50 years, the number of exhibitors and attendees has grown. The exhibitors include not only American gun, ammunition and accessories manufacturers but companies from around the globe, including Europe, the Middle East, China, Russia, Africa and South America. Most of them attend the SHOT Show for the simple reason that the US is the world’s largest market not just for guns and ammunition, but for any product of interest to the complete outdoor market. Those attending the show include exhibiting manufacturers, distributors, importers, exporters, manufacturers’ representatives, buyers, sellers, and several thousand people representing the world’s gun press. The buyers from little mom-and-pop gun shops to the largest chain stores in the industry are usually seen walking the miles and miles of product displays at the shows. The size and diversity of the exhibits is stunning. And, not-surprisingly there are a number of dogs attending every show, some helper dogs but mostly sporting and watch dogs. Security people walking the shows usually also have their working companion dogs with them. While the non-gun press has always been fascinated by the firearms marketing world, they are generally not given media credentials that would give them free reign. NSSF goes out of its way to organize and manage a large trade show professionally and tries to safeguard the reputation of the firearms and ammunition industry for which it is the national trade association. The 2019 edition of the SHOT Show will be held Jan. 22 to 25 at the Sands Convention Center in Las Vegas. 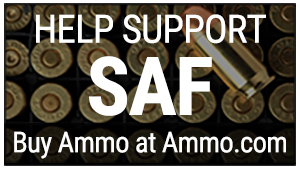 If you are attending the show as a buyer, seller, consultant, or whatever, stop by the Second Amendment Foundation booth on the lower floor.